Bethany House Publishers, 9780764211607, 430pp. In 1944, blond and blue-eyed Jewess Hadassah Benjamin feels abandoned by God when she is saved from a firing squad only to be handed over to a new enemy. Pressed into service by SS-Kommandant Colonel Aric von Schmidt at the transit camp of Theresienstadt in Czechoslovakia, she is able to hide behind the false identity of Stella Muller. However, in order to survive and maintain her cover as Aric's secretary, she is forced to stand by as her own people are sent to Auschwitz. "An engrossing and inspiring story from a talented new writer." --Bestselling Author, Sheila Roberts. A Florida girl who migrated to the Pacific Northwest, Kate Breslin was a bookseller for many years. Author of several travel articles, award-winning poet, and RWA Golden Heart finalist, Kate now writes inspiring stories about the healing power of God's love. 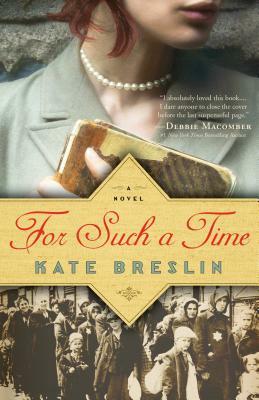 For Such a Time is her first book. She lives with her husband and cat in Seattle, WA. Learn more at www. katebreslin.com.